Thomas Dibdin (1776-1847), book collector, bibliographer, and enthusiastic chronicler of book collecting, wrote a number of influential works, the most famous being The Bibliomania; or Book Madness; Containing Some Account of the History, Symptoms, and Cure of This Fatal Disease. In an Epistle Addressed to Richard Heber, Esq. The first edition appeared in 1809 in a slim volume of eighty-seven pages. Dibdin used a mix of humor, facts, and hyperbole to explore the mysteries of bibliomania. He hurriedly published it in response to John Ferriar’s light-hearted poem The Bibliomania, An Epistle, to Richard Heber (1809). Heber, who served as the inspiration and dedicatee of both works, was a close friend of Dibdin. Dibdin was encouraged by the response to his 1809 Bibliomania but unsatisfied by the briefness of the effort. He completely rewrote and expanded the book over the next two years and published it as Bibliomania; Or Book Madness. A Bibliographical Romance (London: 1811), the text now extended to seven hundred and eighty-three pages, almost ten times the length of the first effort. It was essentially a new book. This monument to book collecting would launch him to fame within bibliophilic circles and remains one of the most enduring classics in the field. Dibdin’s writing style can both inspire and challenge the reader. He is long-winded and circumspect; his asides extend on to a maddening length but are filled with nuggets of interest; his wanderings down bypaths are never-ending. However, he can set a scene. His first-hand recounting of interaction with famous book collectors and their books shines through his turgid style. Bibliomania is better taken in short dips than a lengthy swim. Dibdin was an unreliable bibliographer but he imparts the passion for book collecting as few others have done. Bibliomania and his other writings inspired generations of British and American collectors. Speaking of inspiration, let us now relieve the relative dryness of this didactic approach by the introduction of a Dramatis Personae—ie. a cast of biblio-characters to which the story may be more favorably expressed. The worthy Gentlemen, by whom the Drama is conducted, may be called by some, merely wooden machines or pegs to hang notes upon; but I shall not be disposed to quarrel with any criticism which may be passed upon their acting, so long as the greater part of the information, to which the dialogue gives rise, may be thought serviceable to the real interests of Literature and Bibliography. The characters of the Drama shall include myself as Bibliomagne, and three bibliophilic friends we shall call Forgeron, Ranchenitus, and Nerudius. And now Benevolent Reader, in promising thee as much amusement and instruction as ever were offered in a single essay, of a nature like to the present, we shall begin. Twas on a fine autumnal evening, when the sun was setting serenely behind a thick copse upon a distant hill, and his warm tints were lighting up a magnificent and widely-extended landscape, that, sauntering ‘midst the fields, I was meditating upon the various methods of honorably filling up the measure of our existence; when I discovered I had a new text message. Lo! It was my old college friend Nerudius! He was to come visit me in a fortnight, ready to share tales of biblio-conquests, as he too was of the species called collector. But little did he know of my fresh story that I planned to spring upon him. Indeed, he alone would not be enough audience, so as the sun closed the curtains on another day and my meditation ceased, I reached out to Forgeron and Ranchenitus, simpaticos of a biblio-nature. Their response was positive. This intelligence offered me the liveliest satisfaction. On the appointed evening all three men arrived. After a hearty shaking of hands, I was seated with them in my library; the group of us admiring the overflowing shelves, and, in consequence, partaking of the common topics of conversation with a greater flow of spirits. A sudden consternation shook my fellows. Forgeron quickly spoke up, “Ah, Bibliomagne, you speak metaphorically, a single evening certainly will make do.” Ranchenitus and Nerudius seconded in agreement. Nerudius then added, “For what would our wives do without us for an entire week?” This was followed by laughter and more spirits. Our general discussions about books went on for a lengthy while. Before their arrival, I had placed on the coffee table near us my newly-acquired copy of Thomas Dibdin’s Bibliomania, the 1811 edition. I had purposely said nothing of it. Ranchenitus now curious reached for the tome but I stayed his hand. There was a general discontent. Ranchenitus returned a gracious smile; and the hectic of irritability on his cheek was dissipated in an instant. Forgeron meanwhile had wandered to the shelves and was recalled with difficulty to his seat. “We are ready,” exclaimed Ranchenitus, as he selected my rarest spirits to quench his thirst. The gentle lowing of cattle in the near distance imbued the atmosphere with a bucolic air. Nerudius gently interrupted, “I cannot myself recall a time without books.” The rest of us paused to reflect upon our own maturation in its various forms. “An Evil Man!” exclaimed Forgeron, “To stifle his son’s passions!” Nerudius and Ranchenitus nodded vigorously. “A cheer to a freed Heber!” proclaimed Forgeron. We raised our glasses. No one spoke their true feelings on the matter; in fact there was awkward silence. Nerudius laughed, “He had the disease badly,” and we all understood. The sudden clap of thunder and flash of angry bolts of lightning illuminated the library curtains, and the weather turned surly and pelts of rain beat upon the windows. “We have all been there,” sighed Forgeron, and a lengthy toast to unrequited book love was taken. By now, the quickly-formed storm was thrashing my abode quite fiercely and even we bookmen took notice as the lights flickered. Ranchenitus paused me and raised his glass, “A toast to Dibdin for his fortitude and strength under such difficult circumstances. For life is bigger than books even, lest we forget.” Our thoughts on this and the unabating storm cast a temporary pallor over us. “This seems to be a particular characteristic of book collectors,” mused Nerudius. Forgeron interjected, “A rare knight of books!” and he refilled his glass from my dwindling spirits. Nerudius spoke, “Let it be glad he is not alive today to collect in our areas, although as a biblio-fellow it would be an honor to friend him.” We all agreed. “Can we not now hold your book ourselves?“ asked the eager Ranchenitus, reaching out. At that moment, Zeus, the fickle god of thunder and lightning, unleashed a mighty bolt, and the death bang of a nearby transformer plunged us into sudden and utter darkness. There was a general fumbling in pockets for cellphones. We all attempted to find our flashlight application. Without youth to guide, this endeavor stretched on and darkness prevailed. Then, illuminating the inky black, my German queen, Hroswitha appeared carrying a lit candle and a real flashlight. No more spouse than this could I have wished for. A bibliophile herself, tall, fair, smart and commanding, she ruled me and I liked it. “Greetings, Hroswitha!” said my chorus of friends who knew well the glories of her presence. “Are you boys having a good time?” she replied, placing the candle holder on the table, a safe distance from any book. Her flashlight strobed about from face to face, like a law enforcement inquiry. “Looks like you’ve been drinking,” she said. Betwixt candle and flashlight and the clink of glasses even Zeus could not thwart our merriment. General news for the Queen of their families and spouses consumed a trifle of time. Then amidst this jolly crew, thoughts turned once again to Dibdin, Heber and the book I held in my hand. In truth, I was about to burst. I placed the book gently onto the table and opened it, and all leaned forward as Hroswitha shown the light upon the half-title page in a scene most inadvertently theatrical. “And I must second that,” said Nerudius. Ranchenitus was struck momentarily dumb, and could only make incoherent noises. Hroswitha raised an eyebrow and gazed at me. For once, all were silent and each touched gently the page and I passed the book amongst them, reverential the atmosphere. “That is an extraordinary and sentimental find,” said Ranchenitus. “A true holy relic that connects us across the centuries of bibliophilic fraternity,” added Forgeron. “Certainly so. And also the later provenance must be of interest,” said Nerudius. The gloom of the dark within and sound of steady, pounding rain without was transformed by our close company into an atmosphere of cozy, clubbable ambience. The candle’s cast and the strongly charged flashlight left no one adrift; the warmth of the spirits provided an easy exchange. “Dibdin,” I resumed, “had an avowed purpose for his writings, as he states in another work, The Typographical Antiquities (1810), ‘to awaken a love of the literature of past days; to set wealthy and well educated men a-stirring to collect materials, which, but for such occasional excitement, might, in the end, moulder in oblivion.’ And, he had much success doing so with the publication of the 1811 Bibliomania, becoming closely acquainted with a class of men, such as Heber and Earl Spencer, that in his time he could not have mingled save their mutual love of books. Dibdin would serve as de facto librarian for Earl Spencer, who had a magnificent collection, and whom was an important patron of Dibdin. “Here, here!” trumpeted all of us in our tight bond. “And of Heber?” asked Nerudius. “What a litany of vices!” Nerudius said gaily. Only the heavy rain could be heard, so quiet we became. My Queen Hroswitha and others in the dimly lit circle were moved at Heber’s tragedy fully realized. Hroswitha took the Bibliomania from my hands to hold it. I took a moment to calm my senses and sip the spirit. Everyone was intently focused, “Heber left behind an estimated 150,000 rare books housed in numerous residences in England and Europe. His family could find no will. After weeks of searching various homes by many parties, Dibdin was convinced the lost will was at Pimlico. He writes, ‘I yet persevered; and one morning, when all hope, with those likely to be eventually benefited by its discovery, was about to takes its departure, I found the will! And to reward me, as it were, for my perseverance – as well yet to connect me with my departed friend—I found it lying behind some books within a few inches of my Decameron and Tour.’"
Ranchenitus stood up in the flicker of candlelight, “A last toast this evening to Dibdin, Heber, and Bibliomania!” We then passed around my tome once more as both relic and inspiration before I set it neatly on a nearby shelf. No one put up resistance to the Queen. Each made positive contact with their spouse of the plan and with Hroswitha’s help and steady light retired to various recesses. Somnolence soon engulfed the household and except for intermittent snoring from a guest we shall not name, all was but dreams of infinite libraries and extraordinary books. The auction referred to was The Catalogue of the Private Library of the Late A. A. Smets. . . NY: Leavitt, Strebeigh & Co., Auctioneers, May 25, 1868. The book was lot 619. (The lot number is penciled on the ffep.) The book then founds its way into the collection of Robert S. Williams (1828-1899). It bears his bookplate on the front pastedown. Williams was a Utica, New York, businessman and bibliophile. I have found little about his collecting activities. However, he was an early member of the Grolier Club (1887-1899) until his death. (Notably, his son John Camp Williams [1859-1929], was also a Grolier Club member, and a well-known collector of Americana, book illustration, and English literature. The son’s collection was auctioned in 1929. See Dickinson’s Dictionary of American Book Collectors.) Of particular importance in this instance, Robert Williams was president of the Utica Public Library. 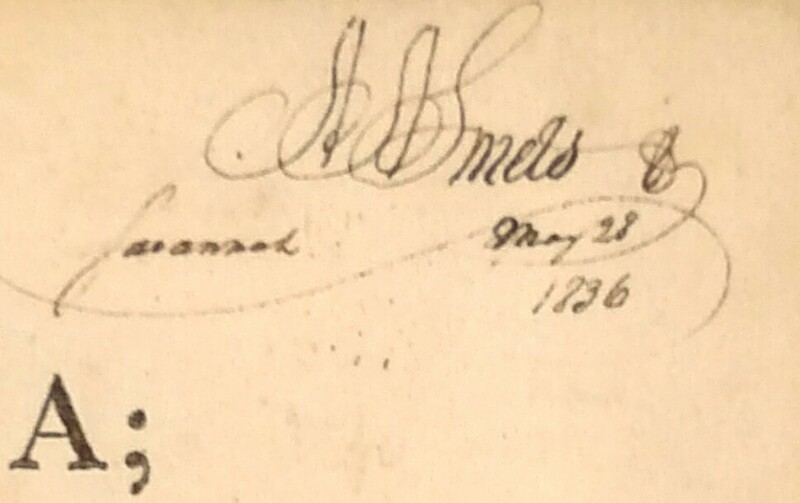 The book bears a Utica Public Library bookplate noting the donation of the book from the estate of Williams. The book then remained in the Utica Public Library for an undetermined amount of time before being deaccessioned. Internal evidence suggests it was there until at least the 1950s-1960s. There is a small stamp on the rear free end paper “Librarian’s Office” and a label, “For Reference: Do Not Take From This Room.” Both Williams bookplate and the donation bookplate have the Williams named purposefully effaced but remain otherwise intact. This suggests that the book was deemed expendable at some point, but the fact it was originally donated by a prominent area family / early library president was not to be trumpeted. The book then entered into the collection / stock of Columbus, Ohio bookseller, Paul H. North, Jr., who was active from at least the early 1950s. About twenty years ago, Ed & Tina Hoffman of Hoffman’s Books in Columbus purchased approximately 80,000 books and pamphlets from the estate of North. The Hoffman’s are still digging out nuggets from this massive horde. 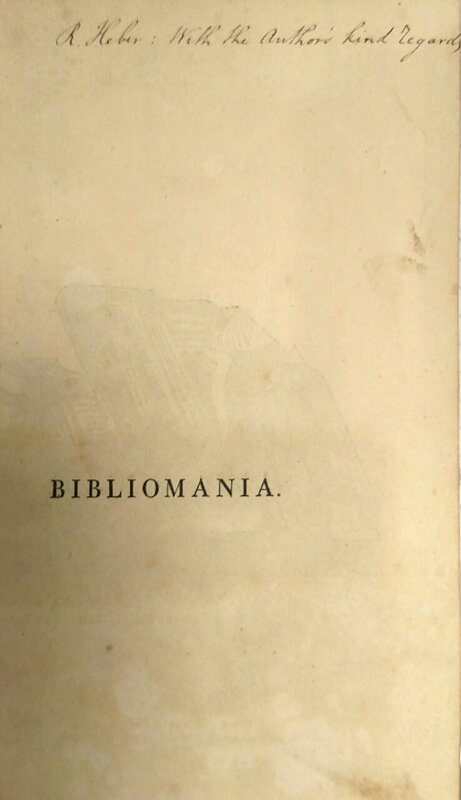 Among them was this copy of Bibliomania. I have purchased a number of biblio-books from the Hoffman’s over the last decade. They know my interests. So, it was a fortunate day in late October of this year when Ed Hoffman contacted me about the Dibdin. Thank you, Ed! The book retains its original binding of full calf with blind-tooled and gilt-framed covers and a gilt-stamped spine with raised bands, all edges marbled. Internally, the book is very clean with only a couple of mild Utica library markings. The time at the library was not kind to the binding, both boards are loose and at some point a hapless librarian used library tape (now removed) to secure the spine but overall it remains a proud specimen. Hoffman suggested it might be a candidate for a rebinding but I think not. I’ve made a neat mylar jacket that holds all in place and next will be a custom box. Your book will be well taken care of during my custody, Mr. Dibdin & Mr. Heber. Rest easy in book Valhalla.